Ben Simmons has become the first Australian named to the NBA All-Star Game, voted in as a reserve for the 2019 event to be held in Charlotte on Monday, February 18 (Australian time). 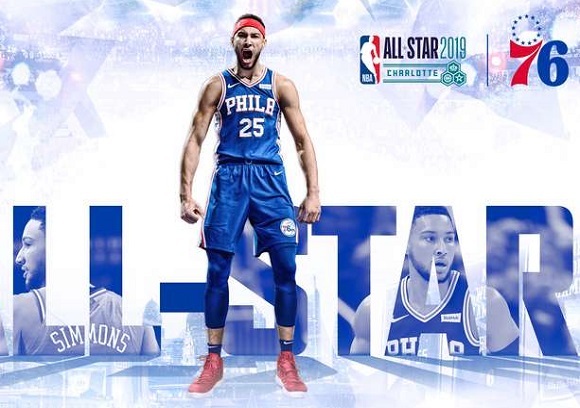 Voted in by the 30 NBA head coaches, Simmons will represent the Philadelphia 76ers in the game where he will play alongside such superstars as LeBron James, Kevin Durant, James Harden, Giannis Antetokounmpo and Kawhi Leonard. Simmons has recorded eight triple-doubles in the 2018/19 season, good for first in the Eastern Conference and tied with Denver’s Nikola Jokić for second in the NBA. He recently notched his 20th career triple-double in his 129th NBA game- the only player ever to reach the mark faster is Hall of Famer Oscar Robertson, who did so in just 45 appearances. This season, Simmons is averaging 16.7 points, 9.5 rebounds and 8.2 assists per game while shooting 57% from the field. He ranks third in the NBA in assists per game and 13th in field-goal percentage, making him the only player in the league to rank in the top 15 in both categories. The All-Star nomination follows Simmons' Rookie of the Year award last season and is sure to be the first of many All-Star Games to feature the rising star of Australian basketball.